Generational Marketing: Are We Getting it Wrong? Generations are a shorthand way of describing a group of people from a particular age group who share similar personal values, needs and expectations based on shared social experiences. For example, post-world war baby boomers grew up during the Vietnam war, Generation X experienced the emergence of music videos, alternative rock and hip-hop and Millennials witnessed the birth of the internet age and are the founders of the ‘social movement‘. It seems like every brand is trying to target millennials these days. Partnering with social media influencers, using emojis in email marketing campaigns, adopting common slang words and devising brand purposes that suit a millennial temperament are just a few strategies used by marketers to engage younger audiences and tap into a consumer base that’s forecast to spend $200 billion in the US alone this year. But in the rush to target younger consumers, are online marketers making a mistake by pooling their efforts to tailor campaigns to a group whose only commonality is the sum of their shared socio-economic experiences? It’s been said that Millennials (people who were born between the early 1980’s and mid-1990’s) value authenticity and creativity. They prefer to spend more money on experiences rather than expensive products such as cars and fine jewellery. Furthermore, they’ve also been associated with the growth of billion-dollar startups including Uber, Airbnb and WeWork, as well as fueling the gig economy. Most importantly, to marketers, they’re not considered to be as loyal to brands when compared to their generation X counterparts. It’s true that, on average, people born from the 1980’s onwards are more accustomed to using the latest tech compared to previous generations. But lumping a large number of consumers into a single group based on broad attitudinal generalisations isn’t the most prudent approach to creating marketing segments – especially if you’re targeting consumers in international markets where huge cultural differences exist. For example, a recent graduate in their early 20’s, who works an entry level job, is unlikely to have the same values and attitudes as a homeowner in their early 30’s, works in a senior level position and has a child under 5. It’s also a misconception that people born before the 80’s are less likely to have adopted the latest tech, shop online or follow social media trends. In fact, the number of over 75’s using social media in the UK doubled last year. According to a report by Ofcom, which looked at the UK’s online habits, there’s a ‘striking’ rise in the number of older people signing into sites such as Facebook and using tablet devices. Furthermore, 48% of baby boomers aged between 65-74 and 41% of over-75’s have a social media profile. In the US, 47% of 65-69 year-olds and 41% of 70-74 year-olds reported using social media according to Pew Research Centre. And with 57% of over 65’s in the US nesting on a household income of over $75,000, millennials aren’t the only generation with spending power. It would be naive to deny the differences between generations. After all, millennials came of age during the 2008 economic crisis and witnessed the unprecedented growth of digital technology. But research has also shown that millennials are, in fact, remarkably similar to previous generations in terms of values and attitudes. Dutch researcher, Martin Schiere, recently completed a quantitative attitudinal study of 15,000 millennials in over 20 different countries. Schiere found that the values of millennials in his study were not too dissimilar from those of generation X and post-war generations. 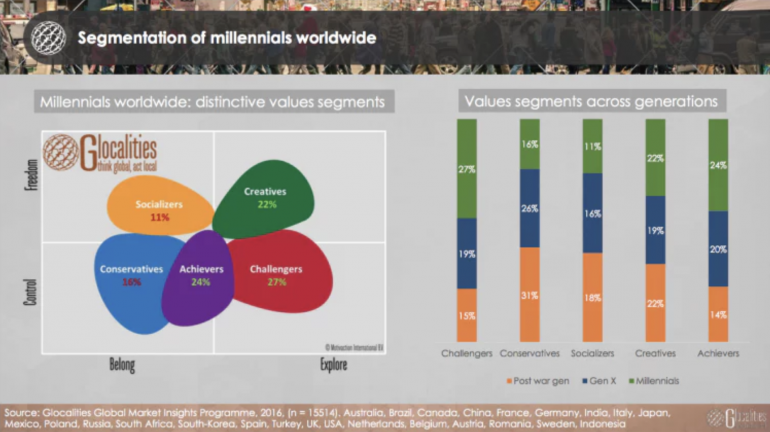 Furthermore, Schiere notes that there are larger differences in values and lifestyles within the millennial generation itself than between different generations. That’s unsurprising when you consider the age range for millennials is currently 22 to 37 according to Pew Research Center’s definitions. Acquiring reliable customer data is critical to any marketing strategy. This data will allow you to gain actionable insights into how your customers interact with your brand – especially if you market to them based on their behaviour and personal preferences. Age, gender, purchase history, date of birth, average order value, customer lifetime value, personal interests, search history and wishlist items are just a few data points that marketers can use to better understand their customers before targeting them with specific campaigns or messages. For example, Facebook allows you to create ‘customised’ or ‘lookalike’ audiences on its marketing platform based on demographics, location, specific interests, purchasing behaviours, device usage and other online activities. Messaging and images can then be tailored based on these individual segments. Although mobile conversion rates are much lower than desktop in Western markets, not all customers engage with brands solely on one device. Showrooming on mobile and tablet devices is common practice as well as transactions involving multiple devices. Nearly 75% of supermarket shoppers in the US have used a physical store to ‘showroom’ before purchasing online according to Nielsen. Investing in cross-device targeting technology can help you understand how your customers interact with your brand online and allow you to target unique messages to your customers to create a more personalised user experience. Customer insight and cross-channel marketing analytics platforms, such as Ometria, can help gain unique insights about your customers by analysing customer behaviours and create automated and personalised messaging through email campaigns or targeted online ads. Additionally, platforms like Nosto allow marketers to create on-site personalised product recommendations, in real-time, based on their unique user behaviour. Testing platforms and digging deeper into your campaign performance using analytics tools will allow you to identify key trends about your customer’s behaviour giving you the ability experiment or adapt your messaging to specific customer segments. It’s also at this stage where generational marketing could become valuable and help you make better decisions on how to communicate with customers. When you consider that 69% of consumers in the UK, US and Australia prefer an individual customer experience, detailed patterns in customer behaviour can’t be unearthed by generational marketing alone. Ultimately the aim is to have the ability to craft smarter marketing campaigns to achieve long-term success. Remember, People are unique. If you want to serve your customers well, don’t simply paint them into age-based boxes. Demetrius Williams is a Digital Marketing Specialist at TranslateMedia and has previous eCommerce experience working with a number of luxury brands in the fashion and beauty industry. He enjoys photography, binge-watching Netflix and can often be found roaming around London with a camera in his hand. Is Nike’s Highly Customised Shopping Experience the New Normal? Is Your Brand Part of the Integrity Economy?